Plastic Multi-Purpose Mini Cups- Got these at Walmart and they have lids on them. They are small. 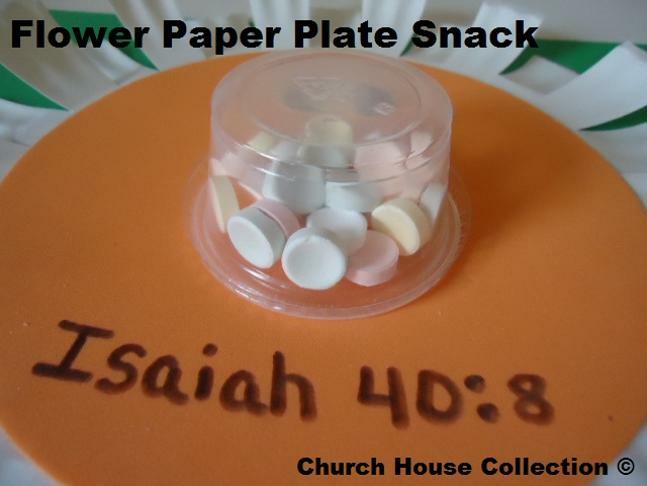 Take your paper plate and make cuts in it all around your paper plate. Don't go into the middle of the plate. Stop where the circle begins on the paper plate. Alternate your folding of the cuts. Just take one strip and fold it back a little. Skip one strip and do the next one. This makes the little flower petals stick out. Use your tape and tape on one of the colorful round foam circles. If you don't have these you could always color it or just cut construction paper out. Or you could just leave it off altogether. Each child will have a different color flower if you use the foam circles. Use your tape again and tape your eyes on. Then take your mini cup with the lid and add some candy to it. You could put smarties, M&M's, Gummy Bears, Cereal, or something else. If you are looking for something healthier instead of candy try using grapes, diced apples, baby carrots, or pretzels broke into. The great thing about that is that you could fill your cup up with the fruit and stick it back in the fridge until the morning you have to take it and then just tape the cups to the front. They way it will be fresh and cold still. So what you need to do is fill the cup up and put the lid back on. Turn it upside down and tape it to the middle of the flower for it's nose. When the kids are ready to eat this just tell them to pull the whole thing off. Lid and all. They whole thing will come off with ease. You could do something extra pretty by handing out different colored pieces of construction paper to each child at their table. This will be their place-mat. Then walk by and lay their flower paper plate snack down on top of it. Or have another child help. 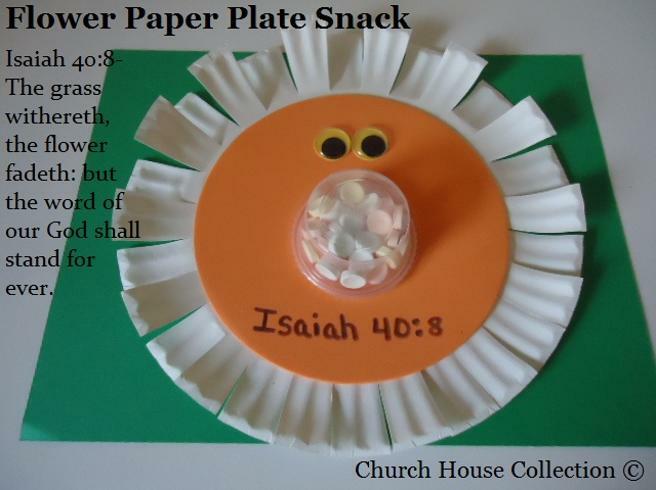 Use this Flower Paper Plate Snack to go along with our Flower Sunday School Lesson. This has stuff to go with it that matches.